Description	 MS in Norwegian, Latin and German on paper, Norway, ca. 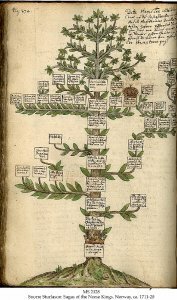 1711-20, 192 ff. 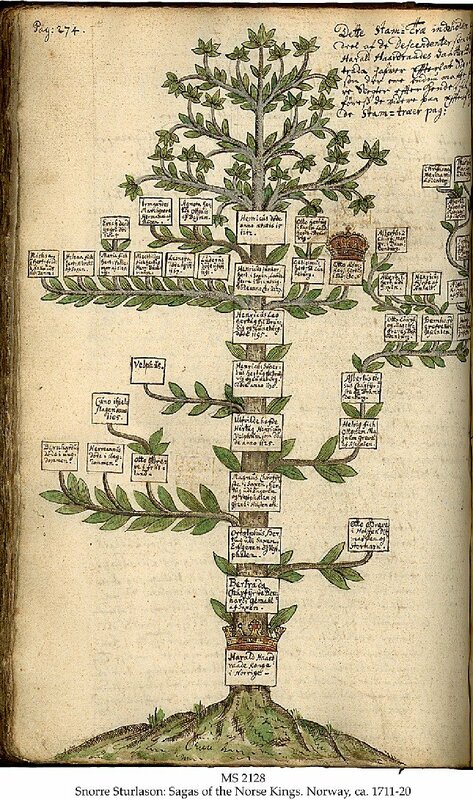 (complete), 32x21 cm, single column, (30x17 cm), 50-70 lines in Norwegian cursive script, notes in margins, 23 full-page genealogical trees in brown with green wash. Binding	 Norway, 18th c., vellum over pasteboard, sewn on 4 thongs, green silk ribbons. Provenance	 1. Bjørn Hansson, Oslo (-1995); 4. Arild and Morten Hansson, Oppegård and Hop, Norway, April 1996. Commentary	 The only Snorre MS in private ownership.